With tensions on the Korean peninsula cooling a little bit Trump says he's willing to talk with Kim Jong-un. President Donald Trump says he'd be open to talking to North Korea's leader Kim Jong-un. Speaking from Camp David, the president also took credit for recently announced talks between North and South Korea. Those talks could be a sign that relations between the two countries could be warming — at least slightly. North Korea hopes to send athletes to the Olympics being held in the South this March. Beyond that, North Korea might be hoping to ease sanctions imposed on it by the United Nations security council in December. But previous cross-border negotiations haven't been the most successful at curbing the North's nuclear ambitions. The last time they held talks was in 2015, and those fell apart. 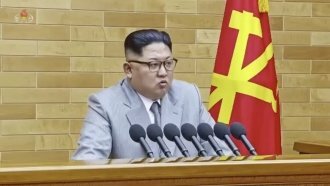 As for negotiations between the U.S. and North Korea, well, there's some evidence the Hermit Kingdom is less likely to act provocatively during those periods. But even when agreements were reached between the U.S. and North Korea in the past, they didn't generally last for very long.